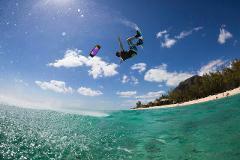 Kiteboarding is an extreme sport and is 80% kite control. 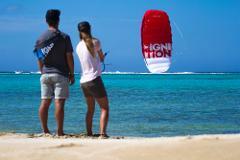 The kite setup and knowing how to use the safety systems and launch/land the kite is essential! This is an all inclusive course. 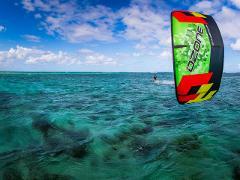 We teach you from the basics and take it right up to getting you kiteboarding upwind comfortably! This course is run over 6 days (2 hours per day) .....it can be consecutive days, or break it up as you like. 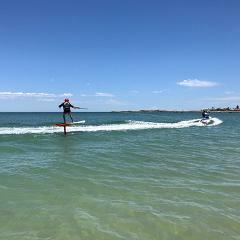 Make use of all that flying knowledge you gained in Level 1, but make sure you wear a flotation vest, and get your helmet communication on because in this level you are ready to get in the water. 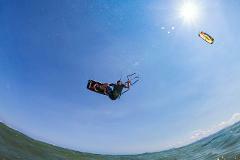 Not sure if kiteboarding is for you? 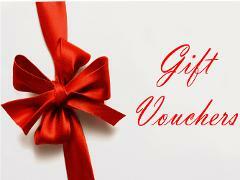 Take this 1 hour taster session to find out! Intermediate to Advanced Lessons are tailored to suit each individual. All private one on one coaching using the helmet communication to help you progress at whatever level you are. 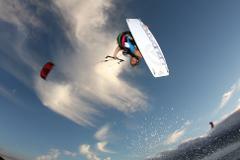 Kite & SUP/Surf Foiling is the latest craze and we have all the lesson options here for you. All private one on one coaching using the helmet communication to help you progress at whatever level you are. Advanced Lessons are tailored to suit each individual. All private one on one coaching using the helmet communication to help you progress at whatever level you are.